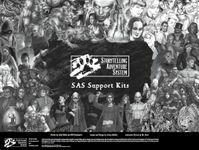 This support kit contains a variety of blank forms for writing stories for your chronicle using the Storytelling Adventure System (SAS). The essay you’re reading now is a guide to crafting adventures in the SAS style for personal use, modified from the advice given to the writers of our pre-constructed SAS adventures. If you haven’t read the SAS Guide yet, you can download it for free...Everything here builds on that material, so take a moment to get familiar with the basics. There are three rough areas for each SAS story – introduction and groundwork, scenes and aftermath. You can delete some areas and add new ones based on the needs of your story, but it’s good to know why each section is there before you start changing them. The sections are covered briefly in the SAS Guide, but this covers them in more detail.